There are always new handbag releases every season. However, once in awhile, there are bags that tend to take over Instagram. You see them everywhere and everybody wants to get their hands on. They become the "it" bags of the season. 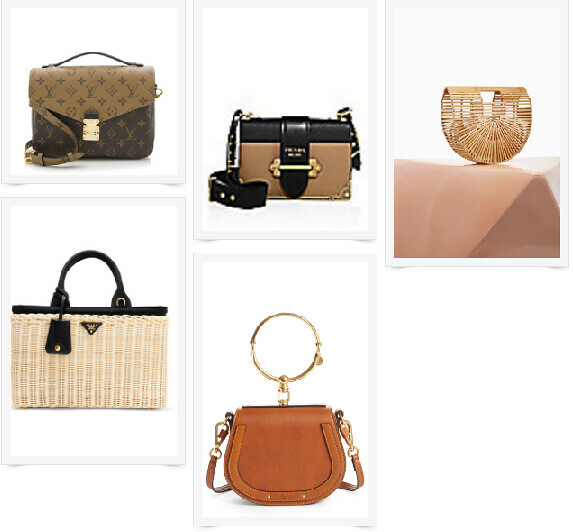 I love to follow handbag trends and think 5 bags below are the hottest bags of the moment. 2. Prada Cahier: While I think Prada bags are very timeless and classic. This bag is the opposite in a good way. I love the boxy look, the contrasting colors and the metal corners. It certainly adds an edgy look to any outfit. 3. Prada Midollino: Another design from Prada that is taking over Instagram as of late. This bag is what I called the perfect summer bag. It's very hard to get a hold of and sold out almost everywhere. 4. Cult Gaia: I am sure you've seen this bag countless times on social media. It's another perfect summer bag in my opinion. Available in an array of colors and is under $150, it's definitely an eye-catching piece. 5. Louis Vuitton Pochette Metis: While I admire those bags, I tend to play it safe when it comes to purchasing a high-end handbag. However, I did consider getting the Pochette Metis in the past. After doing extensive research, this bag seems to have serious glazing issues. I ended up getting the Saint Laurent Sunset bag instead (both have a very similar design). The Pochette Metis released in August 2015 but it's constantly sold out online and my local LV store has a long waiting list for it. I don't know if this bag is in the cards for me in the future but it's still for sure in the back of my mind.